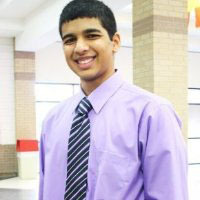 BHP senior Nakul Shah will graduate with business and biochemistry degrees this May. He has maintained a nearly perfect GPA, all while conducting research and being involved on campus and in the community. He also scored in the top one-percent of MCAT test takers. It is no surprise that Nakul has been accepted into numerous competitive medical schools. He will soon be deciding which school to attend and hopes to go on to leave his mark through Oncology research. You are majoring in BHP and Biochemistry. Tell me about combining those majors and how difficult the workload has been. It is difficult because both majors are focused on different things. The application of business outside the classroom is a focus in business classes, so there are frequent projects outside the classroom. Science classes are more focused on reading the material and sticking to the material inside the class. Combining both has allowed me to focus on my passion of science, but also practice case-based learning through business. Doing both has allowed me to focus on the science and find my passion for oncology, but I also got a wider view of the medical field through the business side. What was the process of applying to medical school like? You start early in the year you want to apply. You should start getting materials together in January of the year you want to apply. For rec letters you will need two to six, so it takes a while to talk to your professors and organize it. You have to put down references for all of the student organizations and extracurricular activities you have been involved in, and make sure those people feel comfortable vouching for you. Then there is the personal statement about why you want to be a doctor and it takes a while to write a really good, unique essay. You have to get it in early, before October. I submitted mine in July, but I recommend early June if possible because it is a rolling admissions process, so there will be less spots left the later you submit. First you turn in primary application, then complete the secondary application that focuses on the mission of that school because they all have different missions. I was focused on those with a research mission. From there you may be asked to complete an interview on campus. Usually with two med school faculty members – one professor and one doctor. Their questions focused on science and my interest in being a doctor. For Texas schools there is a pre-match and match program so you will know as early as November or as late as January. Out of state schools let you know by the end of April. It is very hard to balance a full school workload and manage the interviews. Students should keep that in mind when setting their course load for the fall semester of their senior year. You were accepted into very prestigious medical schools. What do you think differentiated you from other applicants? The main thing that set me apart in my opinion was my diverse education at UT. I had the business background, took advantage of the scientific computing program at UT and the top chemistry program. I had the whole view of healthcare – business of healthcare, big data of healthcare and the science education. I applied to 9 schools and received interviews at 7. You scored in the top one-percent of MCAT test takers. Do you have any tips for other students preparing to take the MCAT? One misconception about the MCAT is that you should do something else outside of studying the summer before the MCAT because it will look good on your application. Some schools will immediately reject your application if you do not make their GPA and MCAT cutoff, so make sure you spend enough time on it. It is memorization/materials based so you have to have make a lot of time for it. I spent two full months studying eight hours a day. What are you involved in outside of school and how did you manage that with two difficult majors? In the business school, I am involved in the Undergraduate Business Council and Undergraduate Computational Finance team. Outside of the business school, I was in Eastside Community Connection, which is a non-profit food pantry. I am also involved in research. I started researching my sophomore year and am still doing it. The College of Natural Sciences has a database of research professors, so that is how I found my research opportunities. I am currently researching cancer cells, trying to find drug targets for different kinds of cancers to try to stop tumor growth. I have been on this project since junior year. I applied to medical schools that are research focused, so my current researched was a big topic of conversation in my interviews. What particular area of medicine would you like to be in? Oncology is my interest. Because of the research I have been doing, I became passionate about cancer cells. There are more than 200 kinds of cancer cells, so it is very interesting and challenging research. I also want to stay in academic medicine. I will likely spend 5 years in medical school, as opposed to four, to get more research projects in. After that, the residency program will be four years, then after that I would do a research fellowship, then apply for positions in oncology at a hospital or medical school. Does it seem overwhelming to you when you think about how many more years of learning you have ahead of you? I have been prepared for this for a long time and it makes sense to me that if you are going to trust someone to make life and death decisions, they should spend that long in school learning and honing their schools. It is an honor to be trusted with those decisions and it takes a long time to get to that level of knowledge. What has been your favorite class at UT? Dr. Prentice’s LEB class. It set me up well for interviews. They will often ask about ethical dilemmas and he did an amazing job of preparing me for those questions. He makes you realize you aren’t as ethical as you think and forces you to think about how you would react in certain situations. It really prepared me to critically evaluate my actions. What has been your most difficult class at UT? I took a grad level class in computational chemistry, focused on advanced topics like quantum physics. It was interesting, but very difficult. It was an elective course so I didn’t need it, but I was interested in the topic and it made me a better biochemistry student. As a senior, looking back on your four years, what do you know now that you wish you had known when you started school? I wish I would have been open to more diversity of my education and experiences. From the start I knew what I needed to do and get involved in for med school. There were a lot of great opportunities that wouldn’t have helped my application, but would have helped me grow as a person. There are a lot of music and art opportunities that I would have liked to have done at UT. This entry was posted in News, Student Profiles and tagged Nakul Shah. Bookmark the permalink.